Advancements in the field of diagnostics have come a long way in enabling medical professionals to enhance the lives of chronically-ill patients. Increasing incidence of diabetes around the world has spiked the use of diagnostic methods such as glycated hemoglobin tests. Manufacturers of medical devices are actively focusing on creating new products that serve the critical purpose of glycated hemoglobin testing in the diagnosis of diabetes. An exclusive research report by Transparency Market Research reveals that the growing incidence of diabetes will continue to drive the growth of the global glycated hemoglobin testing market in the foreseeable future. 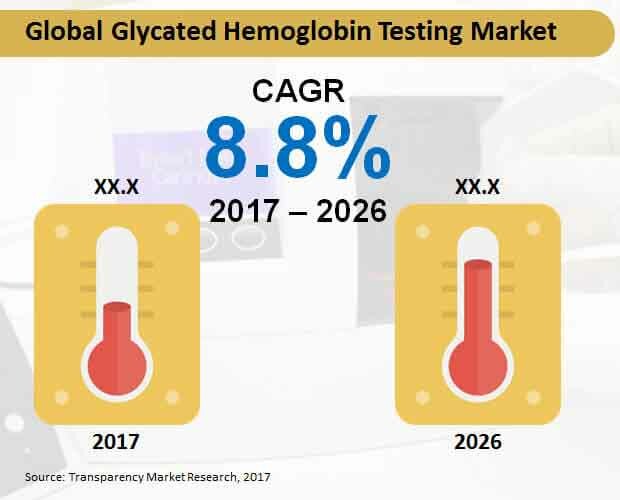 According to the study, the global market for glycated hemoglobin testing will be worth US$ 705 million by the end of 2026. The report projects that improvements in the techniques and increasing preference of diabetics towards early diagnosis will drive the adoption of glycated hemoglobin testing in the near future. During the forecast period, 2017-2026, the global glycated hemoglobin testing market is anticipated to expand robustly at a CAGR of 8.8%. Key findings from the research study reveal that the demand for glycated hemoglobin testing services is the highest in the US and Canada. Consumers in North America are highly prone to diabetes as their proactive lifestyles and hectic professions lead them towards unhealthy diets. In 2017, North America glycated hemoglobin testing market is anticipated to be worth US$ 113 million. During the forecast period, the demand for glycated hemoglobin testing in Europe and the Asia-Pacific excluding Japan region is also expected to gain considerable traction. Patients seeking glycated hemoglobin testing are growing more inclined towards laboratory based tests. While point-of-care glycated hemoglobin testing is more convenient option, the results and diagnostic outcomes of laboratories continue to spearhead their dominance in the global market. By the end of 2026, nearly US$ 500 million worth of glycated hemoglobin tests will be performed in laboratories. However, during the forecast period, point-of-care tests are anticipated to record fastest revenue growth at a CAGR of 10.6%. The report further reveals that hospitals will be the largest end-users of glycated hemoglobin testing in the global market. Through 2026, over one-third share of revenues procured in the global glycated hemoglobin testing market will be accounted by their end-use in hospitals. Diagnostic centers will also be leading end-users of glycated hemoglobin testing, while academic institutes will exhibit moderate traction in terms of adoption. On the basis of techniques, the global market for glycated hemoglobin testing will witness near-equal revenue share from chromatography and immunoassay techniques. With respect to identifying the average concentration of plasma glucose in blood, these techniques are equally effective and affordable. By 2026, revenues accounted by chromatography and immunoassays will individually bring in more than US$ 315 million to the global market value. Several manufacturers of medical devices across the globe have deeply invested in the expansion of the global glycated hemoglobin testing market. In the view of growing contribution of diabetes to revenues of pharmaceutical companies and medical device manufacturers, the overall glycated hemoglobin testing market is likely to remain lucrative in the healthcare sector. Companies namely, Arkray, Bayer, Bio-Rad Laboratories, Ceragem Medisys, Chek Diagnostics, Daiichi Biotech, DiaSys Diagnostic Systems, Diazyme Laboratories, EKF Diagnostics, Erba Mannheim, Human Diagnostics, Lite-On Technology, Menarini, Mindray Medical, Randox Laboratories, Sebia, Siemens Healthcare, TaiDoc Technology, Tosoh Bioscience, and Trinity Biotech are observed as key market participants in the global glycated hemoglobin testing market. Their presence in the expansion of the global market for glycated hemoglobin testing during the forecast period is expected to be active and aggressive. Transparency Market Research has developed an exclusive market study on the global glycated hemoglobin testing market, forecasting its expansion for the assessment period, 2017-2026. This study is developed by considering multiple causative factors that can influence the adoption of glycated hemoglobin testing in the near future. From strategic developments of medical device manufacturers operating in the global glycated hemoglobin testing market to the industry trends, several aspects have been analyzed in the development of this report. For deriving accurate market size estimations, revenues of market participants for the past decade have been aggregated towards generating a baseline for historic market size evaluations. Moreover, changing trade policies, geopolitical developments, and government initiatives have also been considered for developing accurate regional market size estimations for glycated hemoglobin testing. The report provides an in-depth analysis on the use of glycated hemoglobin testing in diagnosis of disorders such as diabetes. An overview of the healthcare sector and a standard outlook on the current scenario for glycated hemoglobin testing is offered in the report. Key research findings from the report have been compiled in the executive summary. The report has also analyzed the value chain in the global glycated hemoglobin testing market, and has further created a breakdown on the supply and demand statistics. Key sections in the study provided segmental analysis and forecast on the global glycated hemoglobin testing market. From regions and their end-uses, to the type of tests and techniques, the global glycated hemoglobin testing market has been extensively examined in the report. Companies partaking in the growth of the global market have been profiled and a detailed competition landscape on glycated hemoglobin testing has been illustrated. Moreover, the report also reveals the current market standings of companies and discloses their strategic developments in business growth. Additional information on cross-segmented analysis and country-based market forecast is also provided in the report. Our team of research consultants, analysts and subject matter experts have created a systematic approach in primary and secondary research methodologies. Different levels of analysis have been employed, and a reliable process in forecasting the global market size estimations have been used in the development of this report. The report serves as a credible business document for companies participating the global glycated hemoglobin testing market. The study provides inferences which can be used by market players towards development of new business strategies. Moreover, the study has the potential to improve the existing undertakings of market players by reveal the most-lucrative as well as the least-lucrative market segments. The report covers a competition analysis which helps the client to track the happenings of key competitors. Concerns of stakeholders and suppliers have also been conveyed through the study. The global market for glycated hemoglobin testing has been analyzed and forecasted on the basis of metrics such as compounded annual growth rates (CAGRs), Year-on-Year (Y-o-Y) growth rate, absolute dollar opportunities, and Basis Point Share index, among others. In addition, market size estimations in the report are represent in US dollars (US$) to capture the global understanding. The key scope of this study is deliver a profoundly-researched forecast and analysis on the global market for glycated hemoglobin testing, and generating key presumptive scenarios for helping companies attain impressive business growth in the long run.